MBBS with Post-graduation in Public Health/DTCD. Maximum Age 50 Years. Minimum Three years of experience in planning, implementation, monitoring and evaluation of Public Health programs in a public or private sector is required. Computer skills particularly working on MS Office is mandatory. Data management, analysis, presentation, report writing along with good communication and skills, both written and verbal along with proficiency in relevant regional/local languages are highly desired. The job requires extensive travelling. MBBS with Post Graduation in Public Health / DTCD. Max Age Quetta Coordinator 45 years. Minimum 3 Years' experience in the Public Health program planning, implementation, supervision, monitoring and evaluation is required. Experience of Developing and implementation training plans, conducting I coordinating and facilitating meetings and other field activities is highly desired. Computer skills particularly working on MS Office is mandatory. Experience is managing MDR-TB will be preferred. Master in Microbiology or molecular biology preferred M. Phil in Quetta Microbiology! Molecular Biology from HEC recognized university. Max age limit 40 years. Minimum 2 years, post qualification experience of working in a microbiology laboratory (testing minimum 5000 samples/year) with sound knowledge of basic principles, techniques, safety procedures and quality management systems. Knowledge of Laboratory equipment and its maintenance is desirable. Master in Business administration. Maximum age: 40 years. Quetta Minimum 3 year experience in record management, or storekeeping in a similar position, in a reputable organization. Experience in a distribution of health products. Computer skills particularly working on MS Office is mandatory. Good communication skills, both written and verbal along with proficiency in relevant regional/local languages are highly desired, Job requires extensive travelling. Bachelors in Medical Lab Technology, maximum age 40 years. 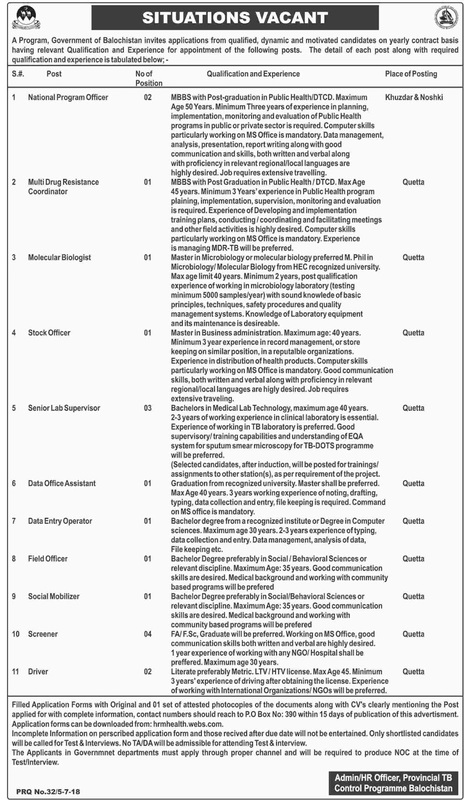 Quetta 2-3 years of working experience in the clinical laboratory is essential. Experience of working in TB laboratory is preferred. Good supervisory/ training capabilities and understanding of EQA system for sputum smear microscopy for TB-DOTS programme will be preferred. (Selected candidates, after induction, will be posted for training/ assignments to other station(s), as per requirement of the project. Graduation from recognized university. Master shall be preferred. Quetta Max Age 40 years. 3 years working experience in noting, drafting, typing, data collection and entry, file keeping is required. Command on MS office is mandatory. Bachelor degree from a recognized institute or Degree in Computer Quetta sciences. Maximum age 30 years. 2-3 years experience in typing, data collection and entry. Data management, analysis of data, File keeping etc. Bachelor Degree preferably in Social I Behavioral Sciences or Quetta relevant discipline. Maximum Age: 35 years. Good communication skills are desired. Medical background and working with community-based programs will be prepared. Bachelor Degree preferably in Social/Behavioral Sciences or Quetta relevant discipline. Maximum Age: 35 years. Good communication skills are desired. Medical background and working with community-based programs will be prepared. FA/ F.Sc, Graduate will be preferred. Working on MS Office, good Quetta communication skills both written and verbal are highly desired. 1-year experience of working with any NCO/ Hospital shall be preferred. Maximum age 30 years. Literate preferably Metric. LTV/ HTV license. Max Age 45. Minimum Quetta 3 years' experience of driving after obtaining the license. Experience of working with International Organizations/ NGOs will be preferred. Filled Application Forms with Original and 01 set of attested photocopies of the documents along with CV's clearly mentioning the Post applied for with complete information, contact numbers should reach to P.0 Box No: 390 within 15 days of publication of this advertisement. Application forms can be downloaded from hrmhealth.webs.com. Incomplete Information on a prescribed application form and those received after the due date will not be entertained. Only shortlisted candidates will be called for Test & Interviews. No TAIDA will be admissible for attending Test & interview. The Applicants in Government departments must apply through proper channel and will be required to produce NOC at the time of Test/Interview.